The 9th International Kuta Karnival – one of Bali’s largest tourism festivals – will be staged from 10th to 14th October this year. 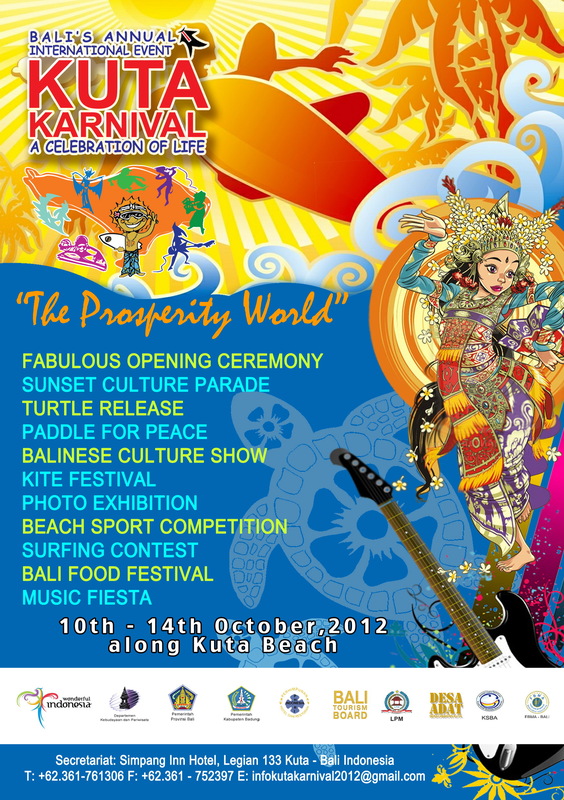 The event will get underway at Kuta Beach with the ceremonial release of turtles on the beach. Other highlights include a kite festival, Balinese arts, cartoon exhibitions, movie screenings, sand sculpture competitions, beach sports, including a surfing competition, a paddle for peace, Balinese wrestling on the sands, “Morning of the Earth” yoga sessions, a Bali Hotels Association’s bartender competition and a variety of musical performances. As part of the overall Kuta Karnival 2012, the Bali Food Festival will also run alongside the main event and will feature cooking demonstrations, culinary competitions and food stalls with a variety of world cuisines on offer. This event will also have movies, DJ sessions, a children’s playground and other entertainment activities. The festival will end with a street parade and a colourful closing ceremony.